Review: Thor: Ragnarok – and or roll! 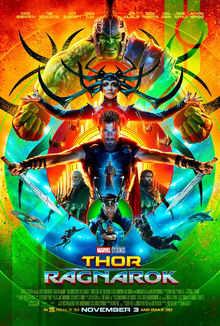 Thor: Ragnarok is the third Thor film and the 17th film set in the Marvel Cinematic Universe. Ragnarok is directed by Taika Waititi, the screenplay is written by Eric Pearson and Craig Kyle and Christopher Yost. The film stars Chris Hemsworth, Tom hiddleston, Cate Blanchett, Idris Elba, Jeff Goldblum, Tessa Thompson, Karl Urban, Mark Ruffalo and Anthony Hopkins. With a score by Mark Mothersbaugh. This time around Thor has to escape from the alien planet of Sakaar and get back home to Asgard. The good; this film is entertaining from start to finish. The film’s tone completely shifts from the previous two, but in a great way. Everyone was laughing throughout the entirety of the movie, along side the humor comes the story, which is equally as engaging. It’s a marvel (pun intended) to see a film that balances the humor and the story so seamlessly. The music in the film is great, the trailer use Led Zeppelin’s Immigrant Song and it’s used in the film as well. A lot of times the trailer’s music isn’t featured in the film at all, which is bizarre cause the trailer adversities something and then the film is something else. This is a case where the marketing is in synergy with the film production. Very refreshing to have the two on the same page, rather than having marketing promise one thing and the actual product is something else entirely. Mothersbaugh does a great job with the score, it’s more electronic, which is such a departure from the orchestral score we’ve gotten in the other two. The reason this works is that we’re on an alien planet, not only do the visuals clue us to that fact, but the music only amplifies that. The music serves the story and the plot, bravo! Moving back to the story, the trailers have scenes with the Hulk, for those in the know, those scenes are adapted/inspired from the comics’ Planet Hulk storyline, blending it perfectly with the Thor story we know from the previous Marvel films. This should serve as an example of how to take more than one comic book storyline and adapt it to the big screen. This is also an excellent example of how to integrate multiple characters who are equally important enough to have their own movies into one movie. Above all, character takes center stage… and there are things that happen in the movie that change who Thor is and the ending doesn’t reset everything, good job! The bad; it ended, when it was finished I wanted it to start back up again. Overall, such a treat, go see this one on the big screen. Thor: Ragnarok has everything from comedy to action and it doesn’t feel messy like some other comic book movies that try to adapt too many stories into one film. Take note, this is how to manage character screen time with character development along with balancing the film’s tone. As a side note, Waititi excels at directing. He’s also brought in some familiar actor, if you follow his body of work. Sam Neil and Rachel House from Hunt for the Wilderpeople. Plus Matt Damon and brother Luke Hemsworth. Waititi voices Korg, one of my personal favorites from this movie. As another side note, the main title is Kirby-esque, wonderful nerd out moment there. This entry was posted in Comics, Movies/TV, Reviews and tagged Anthony Hopkins, Asgard, Cate Blanchett, chris hemsworth, Christopher Yost, Craig Kyle, Eric Pearson, Hunt for the Wilderpeople, Idris, Idris Elba, Jack Kirby Jack, Jeff Goldblum, karl urban, Korg, Mark Mothersbaugh, Mark Ruffalo, marvel cinematic universe, movie review, Planet Hulk, Rachel House, Sam Neil, taika waititi, Tessa Thompson, Thor, thor ragnarok, thor ragnarok review, Thor: Ragnarok movie, Thor: Ragnarok movie review, Tom hiddleston on November 6, 2017 by Eugene.